It's not everyday that a stay-at-home mom gets invited to take a private tour at the Met museum in NYC with representatives of a highend skincare brand and Vogue magazine. So when I got the invitation from AmorePacific to do so about 2 weeks ago, I was thrilled! I was like, "ooh I could stay for 3 days there!" But when I saw that the event was going to coincide with J's 4th birthday, I knew I had to make it a short one. And hence, the 20-hour trip to NYC last week. The invitation was for us, fans of the Korean skincare brand - AmorePacific, to gather at the lobby of Met Museum, because at 9 am that day, we were to take a private tour of Rei Kawakubo / Comme des Garcons - Art of the In-Between exhibition before the museum was opened for public. The exhibit area's very minimalistic, with the color white as its backdrop. Unlike the 2011 Alexander McQueen - Savage Beauty that I visited a few years ago, the Rei Kawakubo exhibit does not feature dark backdrops and moody ambience, neither does it feature artsy videos projected onto a big wall or sound effects serenading certain collections. It was very straightforward and modern. What's cool to me about this exhibit is the fact that it's one of the only 2 exhibits featured by the Costume Institute that is of a living designer (the first one was Yves Saint Laurent in 1983)! 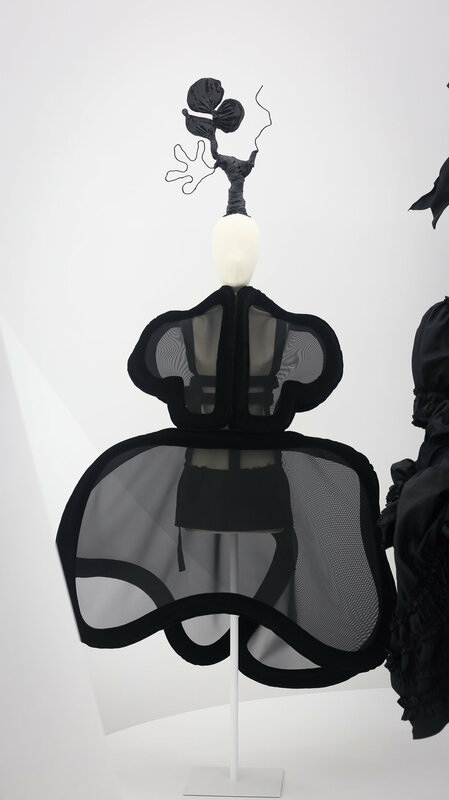 What also stood out for me about the exhibit was the way Kawakubo challenges the traditional ideas of fashion & its functions, gender roles, and women's body. Kawakubo also explores the "presumptive rhythm of life", which consists of birth, marriage, death (dude, is that all there is to a woman's life? goshh lol) in her collections. You see in the pic above, the black wedding gown has little girls dresses attached on it. To me, it's kinda saying marriage is the death of your childhood (truth! this highest form of commitment known to men is not for kids!). The collection on the right pic above captured my attention as well, since it plays with the idea of roses and blood being kind of synonymous. I got a lot of people asking me about my kimono-inspired dress, it's actually by ASOS, click here to purchase it. And click play on the video below to catch a glimpse of all the fun I had! Now it was time to head to The Mark hotel for brunch! The food was delicious but the company I had was sweeter. I met a blogger with a huge following, who not even once tried to talk about herself and her accomplishments unless she was asked about them. I had a conversation with an actress whose film has actually won an Oscar, but refused to make the conversation to be about her. "No, no, please, this is not about me. This is about all of us sharing this experience together," she said, steering the conversation back to the rest of the table after we gushed at her achievements. Nobody had their phones up the whole time, everybody was very respectful, sweet, and just present. And I loved that! It's very refreshing to see that! It was a very intimate morning, unlike any 'influencer meetup' I've been a part of. After that, I changed for a more casual and subway-friendly attire, headed to Laduree to get a box of macarons on Madison Avenue, and then took the subway to Brookfield Place. I met with my friend and host of the trip, Intan, took photos and had some really good skinny pizzas, before heading straight to the airport (thank God my flight was delayed!). It was a short and sweet trip, and I'm glad that I was able to make the most of it! See you in October, NY!